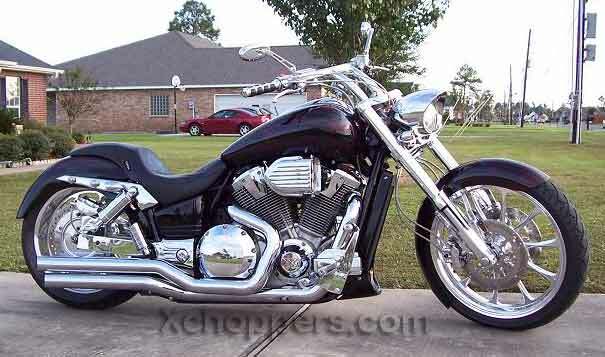 VTX-treme made in the U.S.A. quality! VTX-Treme - 8 degree Raked Trees for the Honda VTX 1800 (all). Make your bike look like a custom with this beautifully CNC sculpted raked triple tree. These beefy trees are precision machined from billet aluminum and give your bike a 40 degree rake. With the required 2" extensions and lowered rear suspension you will have approx. 43-45 degrees of total rake. 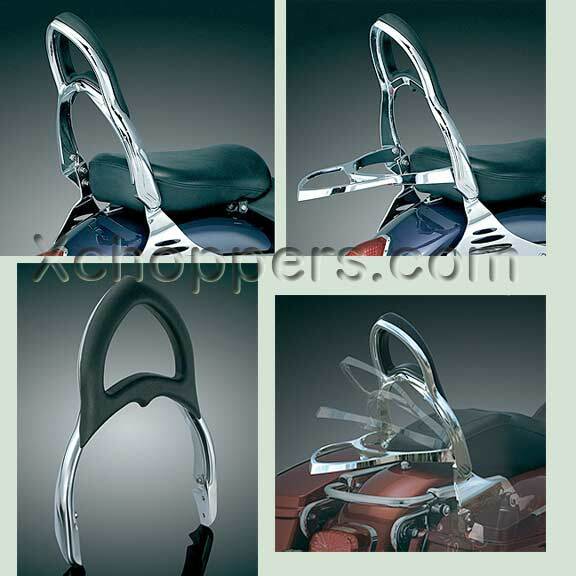 This awesome addition to your bike will turn heads everywhere you go! These 8 degree triple trees will work with stock front wheels and tires on VTX 1800 R/S/N models but not on 1800 C or F. The overall diameter of the front tire on the 1800 C & F is too small which results in too little trail for proper handling and stability. Use of these 8 degree trees on a 1800 C and F requires installation of a 21", 23" or 26" front wheel. 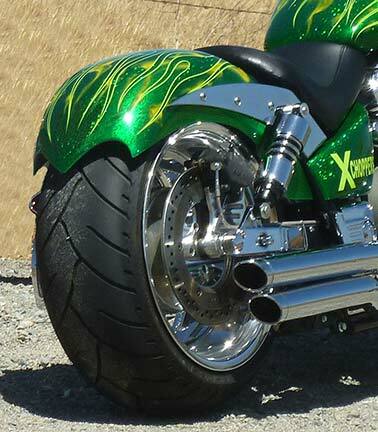 Please see our Xchoppers wheels on this website or call for information. 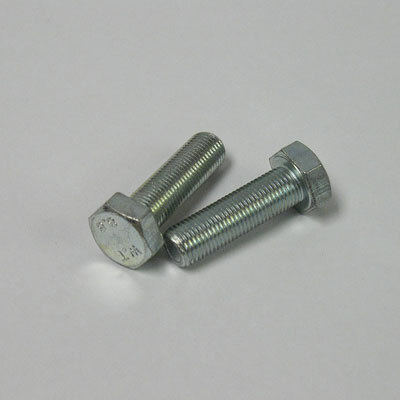 Changing wheel size is a simple, bolt on modification. 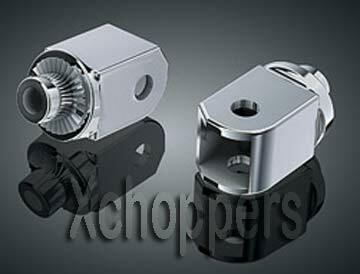 VTX-treme triple trees are supplied with new seals and bearings. 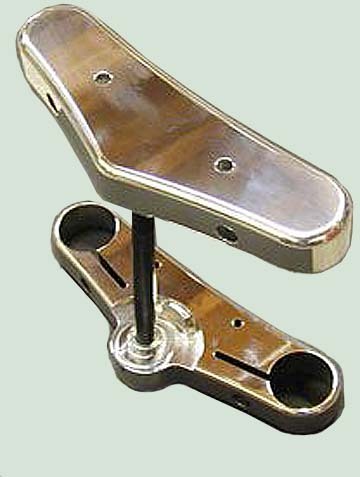 NOTE: Xchoppers can supply these with standard Harley handlebar spacing and machine them to accept standard or custom Harley fork legs. Call 209-833-6174 for more information. Kit includes new genuine Honda bearing, and dust seal. 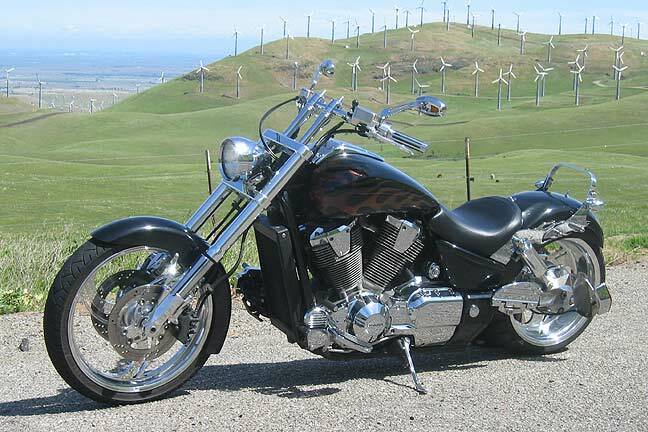 To retain proper steering geometry and handling Installation will also require VTX-treme 2" fork extensions and either 10.5" (preferred), 11" or air shocks on the rear of your VTX (also offered at Xchoppers). If you have any questions about this item...please call before ordering as it may change the handling characteristics of your bike. Pre 2007 1800 C models with stock risers will need the optional billet riser kit or different handlebars for speedo / gas tank clearance. Call for handlebar information. 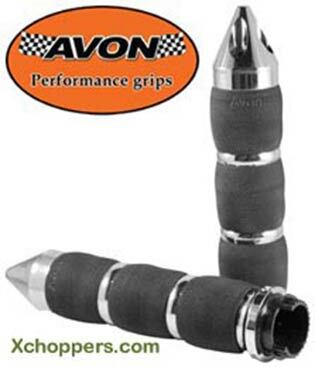 This product may change the handling characteristics of your motorcycle. If you have any questions about this item...please call before ordering. 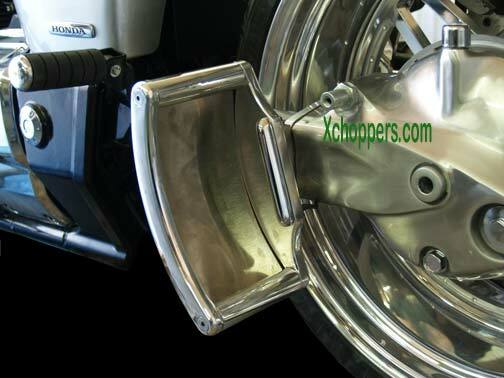 Xchoppers has the information you will need. Installed correctly, this is a great modification! Installation of raked triple trees must always be accompanied with shorter rear suspension units (11" or less) to maintain adequate trail for proper handling. Handling with raked triple trees and stock length rear shocks will be DANGEROUS! 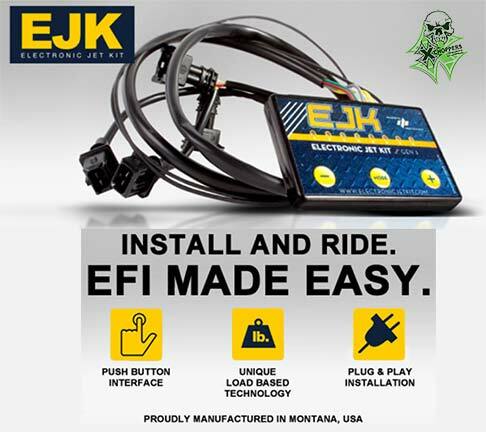 Installation of all components that can potentially affect the safety of the rider/passenger must always be performed by a qualified mechanic. VTX 1800C with 8 degree triple trees and 23" front wheel. No fork extensions are necessary when using a 23" front wheel. 10.5" or 11" rear shocks are recommended for this combination as they are on all bikes with raked triple trees. 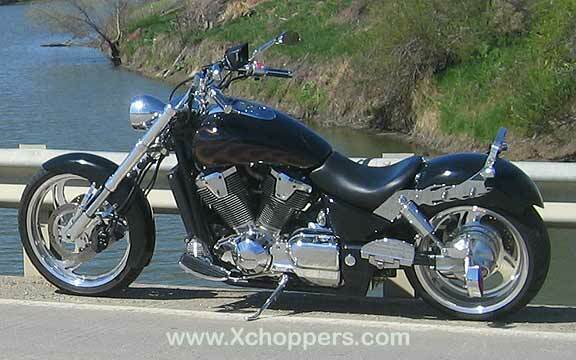 Xchoppers 2002 VTX 1800 C shown above with Xchoppers 240 big tire kit, +8 degree trees, +2" fork extensions, etc. 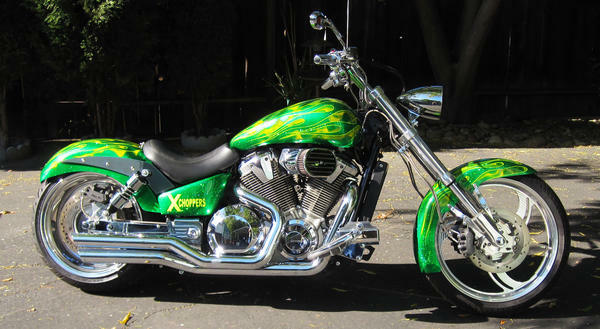 Shown with Xchoppers X Sickles 200 rear fender. 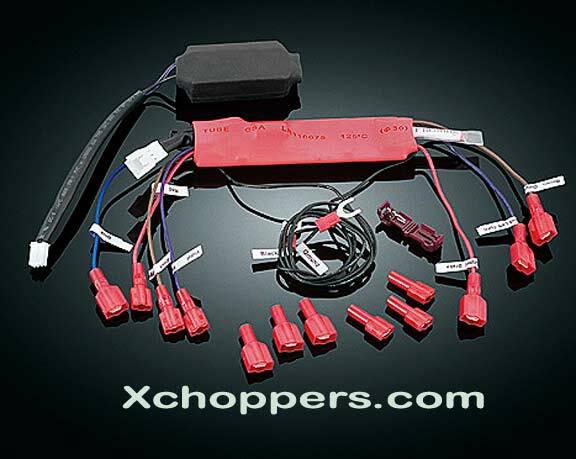 NOTE: Xchoppers will beat any advertised price on VTX-treme products from authorized VTX-treme dealers. Contact us at 209-833-6174. USUALLY SHIPS 1-4 WEEKS AFTER RECEIPT OF ORDER. ALL VTX-treme PRODUCTS ARE MADE IN THE U.S.A.
fitting these 8* triple tree,s was simple and straight forwa ..